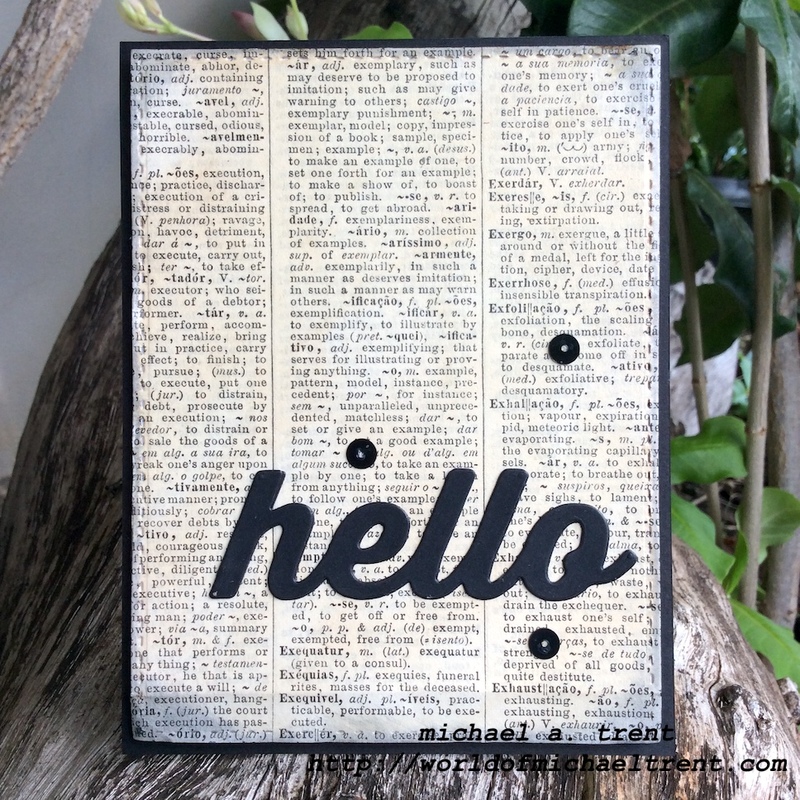 Hello my crafty friends and curious bystanders! I mentioned yesterday that I am in a card swapping group on Facebook and another card I have to make this month is a card using newspaper or a book page. I have to admit, I have never made a card using either and this was easy and fun to make! I started with a piece of white cardstock, some multi matte medium (you can also use decoupage glue) and a torn page from an old Portuguese dictionary. I applied the medium matte to the white cardstock, placed it upside down on the torn dictionary page, and burnished it well with a Teflon bone folder. Then I turned it over, applied the matte medium to the front, and used a heat gun to dry it. Next, I die cut the paper using a stitched rectangle die and then I distressed the edges and a bit of the front with Vintage Photo Distress Ink (Ranger). I adhered a piece of black cardstock to a top folding A2 card base and then went back and distressed a bit more using Black Soot Distress Ink (Ranger). Lastly, I die cut the word "hello" (Oh Hello Again/Memory Box) 3 times, glued them together, and adhered it to the card front. Then I adhered 3 black round sequins to the card front. This was another super simple card to make. The glue dries really quickly and you can use so many different die cut words or big bold sentiment stamps. Thanks so much Kathyk! Glad you like my little idea. And thanks for stopping by the blog and taking the time to leave a comment. Appreciate it. Perfect take on the challenge, Michael. It's simple but elegant at the same time. Enjoy your day! Thanks so much HJ! Glad you love it as much as I do. Thanks for stopping by the blog again.